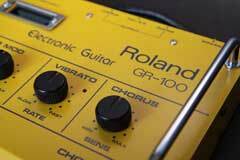 The Roland GR-100 is the least known of all the vintage Roland guitar synthesizers. 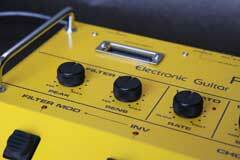 Not to undersell it, but the GR-100 is basically a one-trick pony, a super hex-fuzz machine. 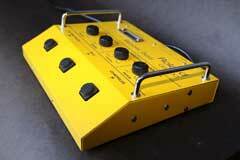 If six fuzz pedals with six -12 dB low-pass filters can make a guitar synthesizer, then this is a guitar synthesizer. 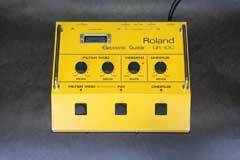 But Roland wisely decided to call the GR-100 an "electronic guitar unit," whatever that means! 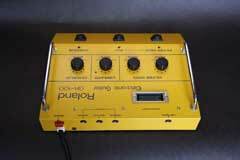 I would have to say it is a very cool polyphonic fuzz box with a smooth low-pass -12 dB analog filter and a very nice chorus and vibrato circuit. 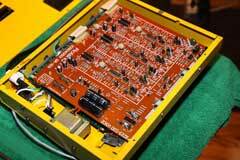 The GR-100 has its own internal hex-fuzz circuit. 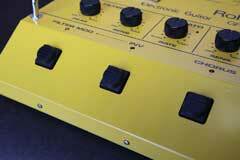 The GR-300 generates its hex-fuzz component by processing the hex-fuzz signal generated by the guitar controller. 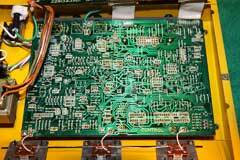 For example, the G-202 has a different hex-fuzz circuit than the G-808. And the G-707 has no hex-fuzz circuit at all. But none of that matters with the GR-100, as it has a slightly more sophisticated version of the G-303/G-505/G-808 hex-fuzz design. 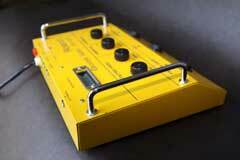 The other addition to the GR-100 is six -12 dB low-pass filters, one for each string. 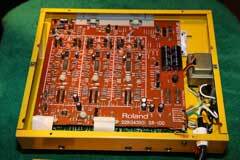 The GR-300 uses one custom Roland IR3109 VCF chip for its -24 dB filter, but the IR3109 has two identical, independent sections. 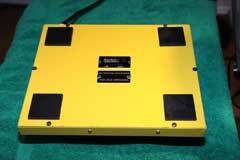 The two sections are cascaded in the GR-300 to create the -24 dB per octave slope. In the GR-33B bass synthesizer, the filter section is also cascaded for -24 dB response, but the GR-33B adds a simple SPDT switch to access the cascaded IR3109 mid-point to provide the -12 dB output option. 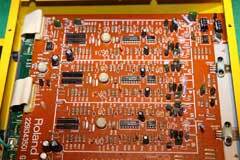 In the GR-100, three IR3109 chips are used, with each IR3109 chip processing two strings with -12 dB response. 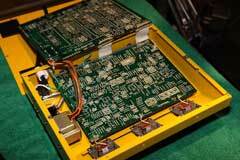 And the IR3109 is used in the GR-700 as well, as part of the dreaded 80017a assembly. If you have listened to filter sweeps using the GR-300, you may be a little disappointed with the GR-100. The GR-300 filter is a -24 dB low-pass design, meaning you can get fairly dramatic sweeps. The GR-100 only has half of the slope of the GR-300, so the effect is not as dark or strong. Using the envelope triggering, the GR-100 calls to mind a really cool auto-wah pedal, but with the advantage that each string is processing independently for greater clarity. The GR-100 also includes an adjustable frequency (resonance) peak as well. One note on the Roland IR3109 chip: Roland seems to have a company policy of including at least one irreplaceable component made from "unobtainium" in every major product they build. 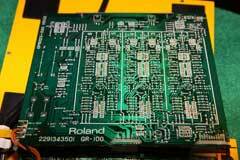 The IR3109, the heart of the VCF/VCA in the Roland GR-100, GR-300 GR-33B and GR-700, is such a component. 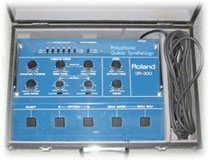 While it is possible to build almost an entire GR-100, GR-300 or GR-33B from scratch by following the schematics, you will still be missing the IR3109 and its mate the Roland BA662, which gives Roland analog synths much of their character. 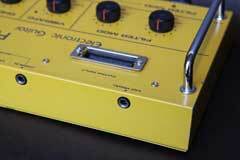 Ones of the nicest features of the GR-100 is the chorus/vibrato circuit. What can I say? 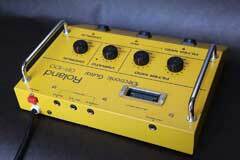 This is vintage Roland analog sound. 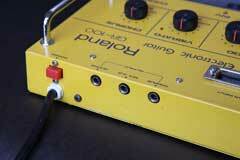 The circuit is quite similar to the old Roland CE-1 chorus pedal. The chorus/vibrato are two flavors of the same circuit. 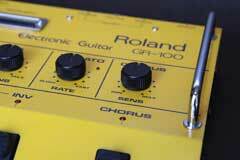 When in Chorus mode, the GR-100 offers a sensitivity control, which is like the chorus intensity control on the CE-1. Like the Roland CE-1, the "vibrato" mode offers full control over rate and depth, and represents the "wet" or effect only output of the chorus/vibrato circuit. 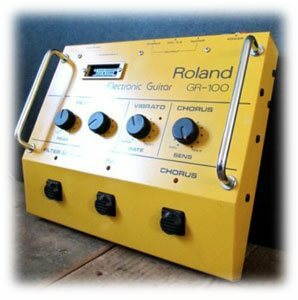 Owning a GR-100 just for the chorus and vibrato sound may be a bit extreme, but like so much of the analog world, there is nothing else quite as sweet and unique as the GR-100’s chorus and vibrato. And, in a nice touch, the Vibrato LED does not glow until the Vibrato circuit is actually engaged with the touch pads. Cool. 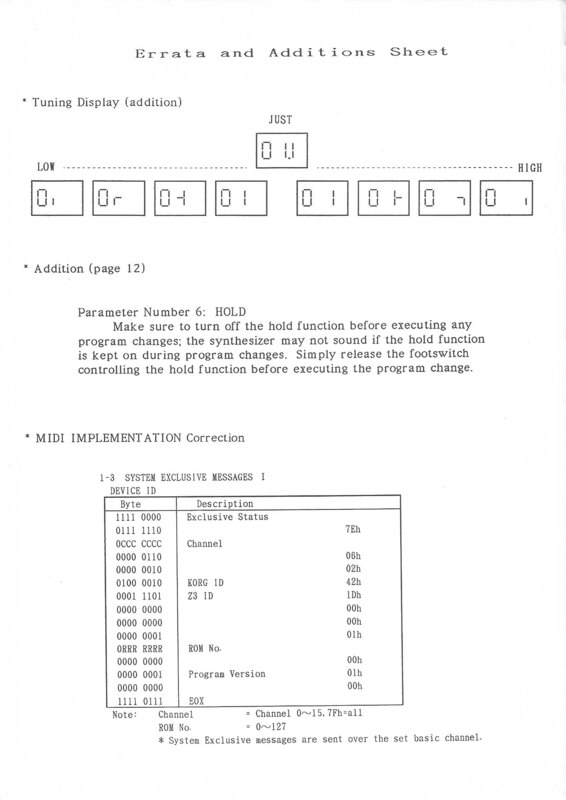 The Roland GR-100 Owner's Manual has a list of "Factory Presets", Sample Sounds, at the end of the Owner's Manual. These sample sounds were intending to give some direction on how to use the GR-100, using features such as Filter Modulation, Chorus, and Vibrato, all served up with the classic hex fuzz sound the GR-100 is famous for. Check out this new YouTube video I posted which goes through the Sample Sounds to get a little flavor of what this vintage 'electronic guitar' synth sounded like! 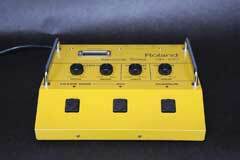 There are no known service bulletins from Roland addressing any GR-100 problems. As a safety precaution, I strongly recommend replacing the original blue tantalum capacitors. 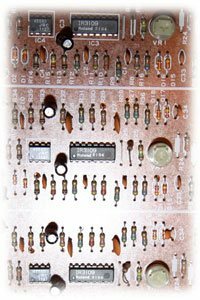 These capacitors, while very popular in the late seventies, are known to fail. GR-100 Failed Switch or Broken Pin Mechanism. 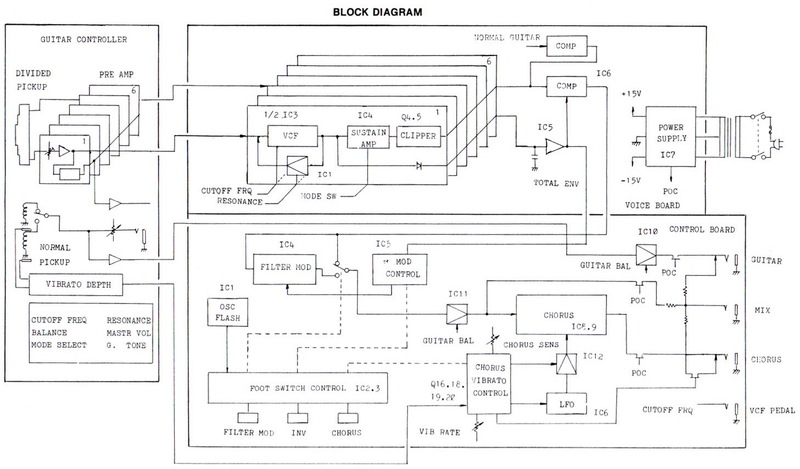 Download the GR-100 Service Manual Schematics. 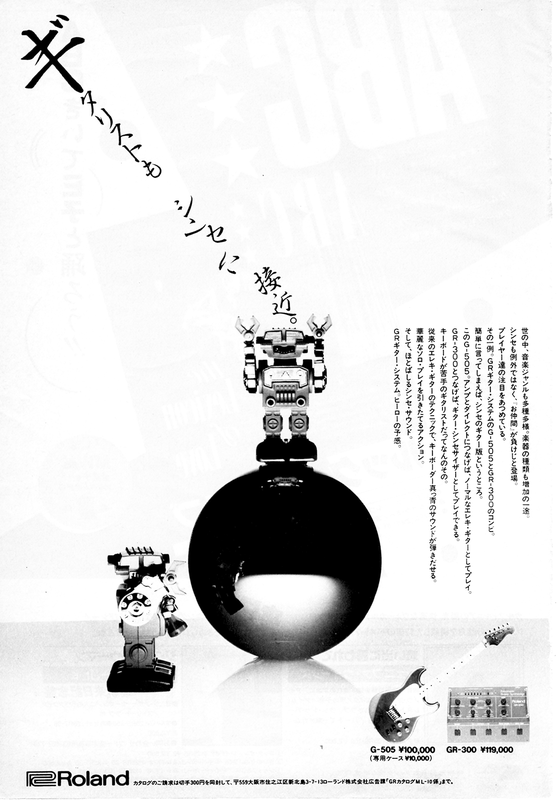 Page six of the 1984 Roland GR series brochure lists several options and accessories for the GR-100. 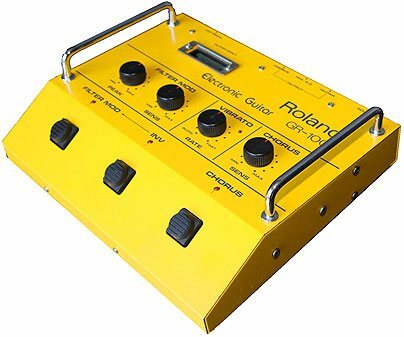 Most of these accessories are impossible to find now, but there are modern equivalents that you can use to expand the playing experience with the vintage Roland GR-100. 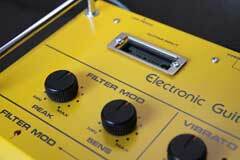 Details on the Roland GR-100/GR-300/GR-33B/GR-700 filter pedal options.